The Gorkha Janamukti Morcha has given a ten-day deadline to the Centre to intervene in the Gorkhaland statehood stir as the indefinite shutdown in the hills entered its 47th day today. 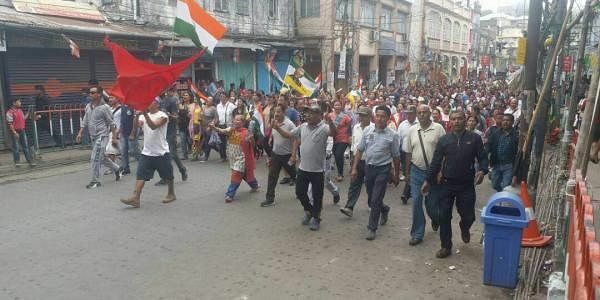 DARJEELING: The Gorkha Janamukti Morcha has given a ten-day deadline to the Centre to intervene in the Gorkhaland statehood stir as the indefinite shutdown in the hills entered its 47th day today. "We have given a ten-day deadline to the Union government to intervene. An indefinite shutdown is going on for the last 47 days. The Centre can't just sit idle when the hills are burning," GJM assistant general secretary Binay Tamang told reporters last night. The GMC has sought an appointment with Union Home minister Rajnath Singh to brief him on the ongoing crisis in the hills.